A pulpit commemorates the members of the congregation who died in service or were killed in action in World War One. On 28 September 1919, it was unveiled by Private J. P. Woods, V.C. in the 'new church'. The memorial was transferred to the Wesley Church (1883), when the 'new church' was demolished circa 1945. An impressive ceremony took place in the Guildford Methodist Church on Sunday afternoon, when a memorial pulpit, raised to the memory of adherents of the church who fell in the great war, was unveiled by Private Woods, V.C. His Excellency the Governor (Sir William Ellison-Macartney) attended to take part in the ceremony, and was accompanied by Captain North. 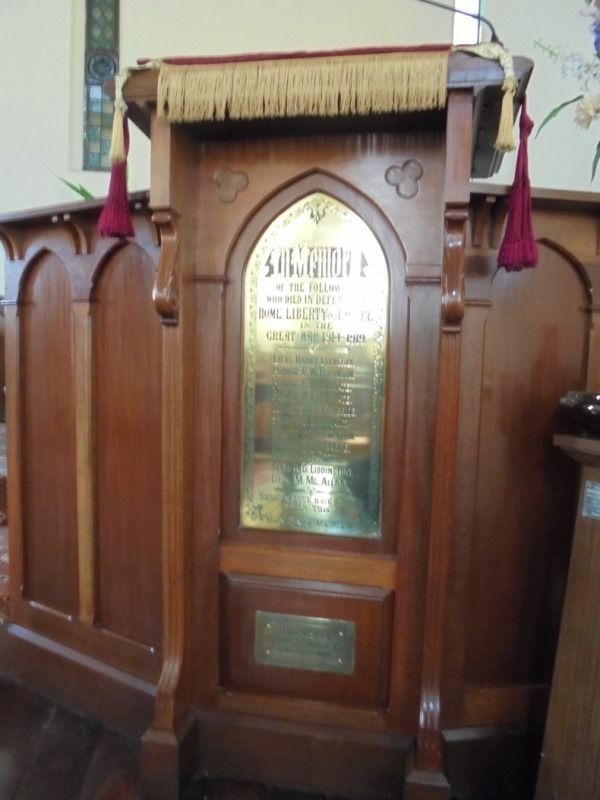 The unveiling was then performed by Private Woods, the pulpit being a chaste example of ecclesiastical furniture in polished jarrah, with an engraved brass tablet bearing the names of eleven adherents of the church who had fallen in the war. Wreaths were placed on the pulpit by children of men who had given their lives and by the Red Cross Society, and after the president of the conference had congratulated the Guildford circuit on being the first church to provide a memorial to the fallen, the service closed, with the National Anthem. Western Mail (Perth), 2nd October 1919.